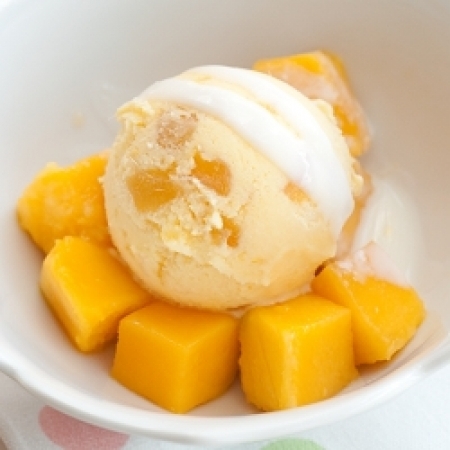 So this is what you need to make Mango Ice cream. It is quick and easy and yummy. One nice ripe Mango. Choose a mango with nice taste. Grind the sugar in a mixer/blender and make a nice smooth mix. Cut mange into small pieces and put in the blender and mix along with sugar. In a bowl take cream and whip it little bit till it looks smooth. Add the sugar and mix well. Slowly keep on adding the mango puree and mix well, till the cream is soft and has a nice soft texture. Once the Ice cream is half set, take it out and again mix in the blender . This makes your ice cream to be more smoother. Once done, again place the mix in the bowl. Finally, I added small chunks of mango to the cream mix as it gives a nice natural touch to it. Keep in the freezer and let it cool and set. While serving, add little bit of mango puree or mango chunks and a mint leave on top. Additionally,you can also add some mint leaves to the cream or roasted and grated dried coconut if you want. This is how the end product will look like when u scoop it out. My above pic doesn’t do any justice to this recipe, even though it tasted yummy. Isn’t it simple Girls? If there are any guys reading this post, you can also try this and surprise your partner :). This is super easy and yummy. Let me know how it went for you. Thanks Rakhi..yes it was..try it out..its super easy :)..